On April 13, 1977, the USPS issued the first stamp in the American Folk Art Series. The USPS created the Folk Art Series in 1977 to honor important and lesser-known items in American art and culture. Folk Art is loosely defined as the art of the everyday, rooted in traditions that come from community and culture and expressing cultural identity by conveying shared community values and aesthetics. The first set in the series was issued on April 13, 1977, in Santa Fe, New Mexico. 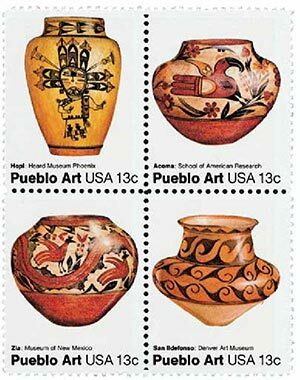 The stamps featured the pottery of Pueblo Indians from Arizona and New Mexico. An important aspect of Pueblo culture is pottery making. The pottery of each village has its own special designs. Pueblos continue to make their pottery the traditional way, fashioning it out of ropes of clay, which they smooth before firing. The second set in the series was issued on March 8, 1978, in Charleston, West Virginia at a quilt show. Each of the stamps in this block of four, pictures a basket design from a quilt made in New York City in 1875. Although the industrial revolution made it possible to mass produce inexpensive blankets, the quilt was considered to be attractive, practical, and very economical. The third issue in the series featured Pennsylvania Toleware (French for painted tin). The stamps were issued on April 19, 1979, in Lancaster, Pennsylvania at that city’s Pennsylvania Farm Museum. Pictured on the stamps are a coffee pot with a straight spout, a tea caddy, a sugar bowl, and a coffee pot with a gooseneck spout, all of which were made in the early 1900s. The fourth set in the series was issued on September 25, 1980, in Spokane, Washington. Honoring Pacific Northwest Indian Masks, each stamp pictures a different carved mask: Heiltsuk Bella Bella mask, Chilkat Tlingit mask, Tlingit mask and Bella Coola mask. The sixth set in the Folk Art Series featured Navajo Blankets. They were issued on September 4, 1986, in Window Rock, Arizona. The stamps were issued to coincide with the annual Navajo Nation Fair there. The illustrations are based on actual Navajo blankets, three of which are housed in the Museum of the American Indian in New York City. Blanket weaving has been an important part of Navajo culture for centuries. To early tribes, each blanket was believed to possess spiritual characteristics and reflect the owner’s identity. The seventh set in the series pictured different wood-carved figures. They were issued on October 1, 1986, at the National Gallery of Art to kick off National Stamp Collecting Month. From the Colonial Era through the 19th century, wood-carved figurines were even more widely used than today’s billboards. Few merchants felt competitive without a three-dimensional representative of their products or services. The eighth set in the series honors lacemaking. The stamps were issued on August 14, 1987, in Ypsilanti, Michigan as part of a local lace makers convention. The stamps picture different lace patterns created by lace makers in Michigan. The USPS spent several months exploring different printing techniques to find one that could best capture the fine detail of the lace patterns. The ninth set in the Folk Art Series featured carousel animals. The stamps were issued on October 1, 1988, to mark the start of National Stamp Collecting Month. The first day ceremony was held at Cedar Point Amusement Park in Sandusky, Ohio, which was home to four hand-carved carousels, including one of the horses pictured on these stamps. The tenth set in the series featured Indian headdresses. The stamps were issued on August 17, 1990, in Cody, Wyoming at the Buffalo Bill Historical Center. The headdress set was the first in the Folk Art Series to include five stamps and was also the first in the series to be issued in booklet form. The headdresses were prized personal possessions, generally created by the warrior himself, and were usually buried with their owner at death. The final issue in the series featured a familiar topic – carousel horses. The stamps were issued on July 21, 1995, in Lahaska, Pennsylvania. At the suggestion of artist Paul Calle, the first day ceremony was held at the Carousel World Museum. The first set of carousel animal stamps had been so popular, the USPS was excited to issue a second set, which featured four different horses. Click here to get all the American Folk Art stamps in one convenient set. One Response to "This Day in History… April 13, 1977"
Some of the prettiest stamps the U.S. has issued. Thanks for the comprehensive review.